I am Attila Soldus. 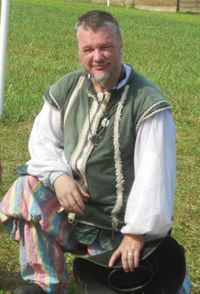 I began fencing in the SCA in November, 2008 in the Shire of Hartshorn-dale after being introduced to SCA fencing the previous summer by Lord Po Sivertop (now Don Po) of the Barony of Endless Hills in the Kingdom of Æthelmearc. I have been involved in fencing in the Southern Region of East Kingdom and the portions of Æthelmearc which border it. Basically, my SCA activities consist of fencing and brewing mead. I am a mercenary soldier who started his career in Hungary and has fought on battlefields throughout Europe. If I am to be called before court, someone needs to make sure that my wife, Viola Soldus, will also be in attendance. I am indifferent to being surprised, my pleasure in being prepared to respond appropriately is no less, and no greater, than my joy in being unexpectedly recognized. This page was last edited on 1 March 2019, at 23:22.